New accessions arrive at ERO in a steady stream, and sometimes a very special survivor from the past comes into our care. One such item that recently came into us is this map of Grays dating from 1631, made by a surveyor named Samuel Parsons (A14738 box 1). The map in our Conservation Studio after being cleaned. East is at the top of the map. The area shown is the west side of Grays. London Road, shown running along the south side of the map, is today’s A126, and Hogg Lane, shown running along the east side of the map, is today the A1012. The salt marshes shown along the banks of the Thames are today housing. Part of the area shown in the middle of the map is today Grays Chalk Quarry Nature Reserve, part of it is Badgers Dene housing estate, part of it is Askews Farm Industrial Estate, and part of it is a NuStar oil and gas terminal. The map was made for George Whitmore, Lord Mayor of London, and shows land that he owned in Grays called Notts (alias Ripleys), Wrightes and Lords Land. Whitmore was a merchant and member of the Worshipful Company of Haberdashers. During the Civil War, not long after this map was made for him, he supported the king and was imprisoned by the Parliamentarians. Traditionally, surveys of estates were written documents, and the practice of making maps to either supplement or replace a written survey only started to take off in the 1570s. This type of map served two purposes: firstly, they were useful tools for ensuring efficient and profitable use of land; and secondly, they were status symbols for land owners. At the centre of the map is Notts Farm, alias ‘Rippleyes’, surrounded by cherry orchards. The names and acreages of the individual fields are listed along the left-hand side of the map, including ‘the eleauen [eleven] acres’, ‘Wallnutt tree feilde’ and ‘Pearetree feilde’. 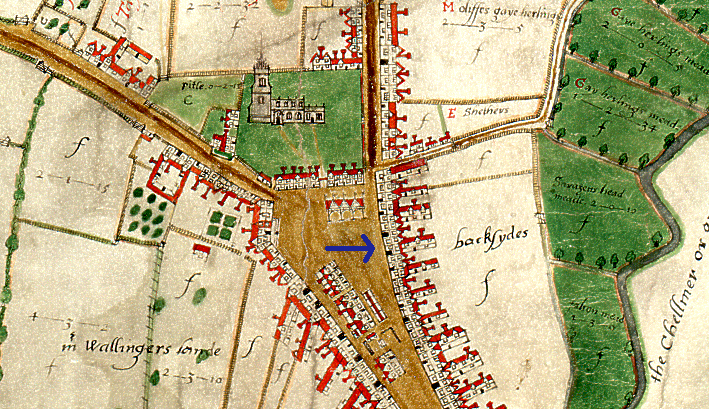 Grays church is shown in the top right corner of the map. And ‘The River of Thames’ flows along the right hand side of the map, with salt marshes along its edge. Parsons shows wooded areas using tiny, individually drawn trees. Each one is coloured in green and yellow, adding detail and dimension. The map joins two other documents made by Samuel Parsons already looked after at ERO. One is a map of land around Coggeshall Grange made in 1639 (D/DOp P1 – view a digital image of it here), and the other is a written survey of land in Little Bentley (D/DQs 4). The Coggeshall map shares several stylistic similarities with the newly arrived Grays one. Both share the same patterned border, and decorative scale giving Parsons’s name as the maker. The Coggeshall map shows Coggeshall Grange, including the barn which is today a National Trust property, shown here in ‘the Graunge yarde’. The first surviving work of Parsons’ in Essex is his survey of land in Little Bentley in Tendring (D/DQs 4), made for Sir Paul Bayning, who was from a family of wealthy London merchants. This written survey book refers to a map made by Parsons at the same time, but this sadly seems not to have survived. Parsons signed this survey as ‘Samuell Parsones Practitioner in the Mathematicks’. Most of Parsons’s surviving maps were made in Shropshire (you can view an image of his 1635 map of Rudge Heath on Shropshire Archives’ catalogue here). Indeed, there is a connection between some of Parsons’s Shropshire maps and his map of Grays; some of his Shropshire work was for the Whitmore family of Apley Hall, of which George Whitmore (the commissioner of the Grays map) was a member. In his study of 17th century mapmakers in Essex ‘An upstart art. Early mapping in Essex’ (T/Z 438/2/1) A. Stuart Mason, an expert on early map making suggests that Parsons may have been based in London, meeting his wealthy clients there, and being despatched to the countryside to survey their estates. His signature as a ‘Practitioner in the Mathematicks’ could suggest, according to Mason, that Parsons may well have taught mathematics in London alongside his surveying work. Parsons made maps of extraordinary quality for their time, and we are very happy to welcome this new addition into our collection. 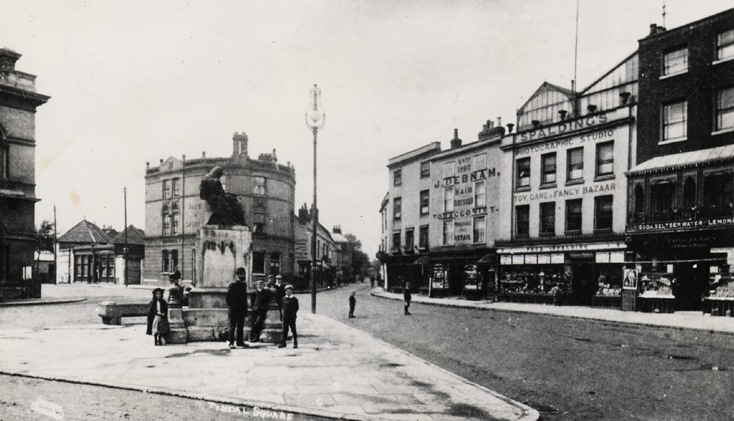 In the twelfth and final post from our Chelmsford Then and Now project, student researcher Ashleigh Hudson explains how during her research project we used maps to establish areas of continuity and change in the High Street of our county town. A key objective of the Chelmsford Then and Now project was to establish what has changed and what has stayed the same over time in the centre of our county town. We are lucky that Chelmsford has been mapped and re-mapped several times over the centuries, enabling us to make comparisons over time, and to find traces of the medieval town in today’s High Street, even though no buildings from that period survive. In this post we will show how we have used maps in this project to look at the detailed history of specific properties. The earliest known map of Chelmsford was drawn up by John Walker in 1591. The shape of Chelmsford High Street, as depicted on the Walker map, is remarkably similar to the shape of the high street today; in fact the basic make-up of the town has not changed in nearly five hundred years. Internally, the shape and size of individual properties has varied significantly over time, reflecting changing economic, demographic and technological trends. The 20th century in particular saw sweeping changes to areas of the high street. As the town’s population increased, the demand for more retail spaces grew, and the arrival of department stores facilitated the absorption of many of the smaller businesses. 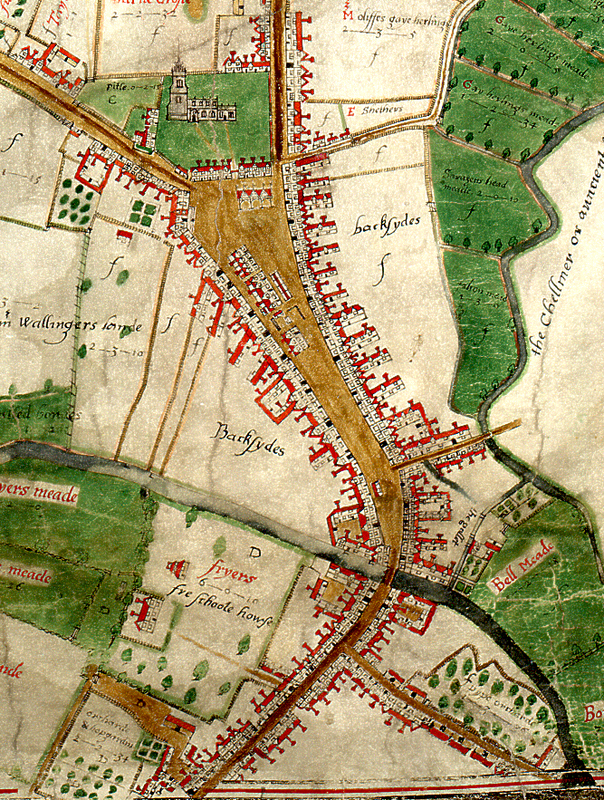 Extract from John Walker’s map of Chelmsford, 1591. Observing the sites of 61-66 High Street on several Ordnance Survey maps, it was immediately obvious that a number of properties had been consolidated, demolished or rebuilt over time. Using the first edition OS map of 1876 as a starting point, it is clear that large, department sized stores were not yet a standard feature of the high street. Based on this map, we can see that properties in this section of the high street were small and packed closely together, perhaps the result of centuries of uncoordinated and sporadic development. Extract from the 1876 first edition OS map, from the west side of the high street. 61 High Street is occupied by the Queen’s Head inn. Adjacent to the Queen’s Head sits a narrow passageway, which leads from the high street into the yard. To the north of the passageway is the site of 62 High Street and adjacent to that, a number of small, individual properties, all of which would ultimately form part of the Marks and Spencer’s site in the 1970s. 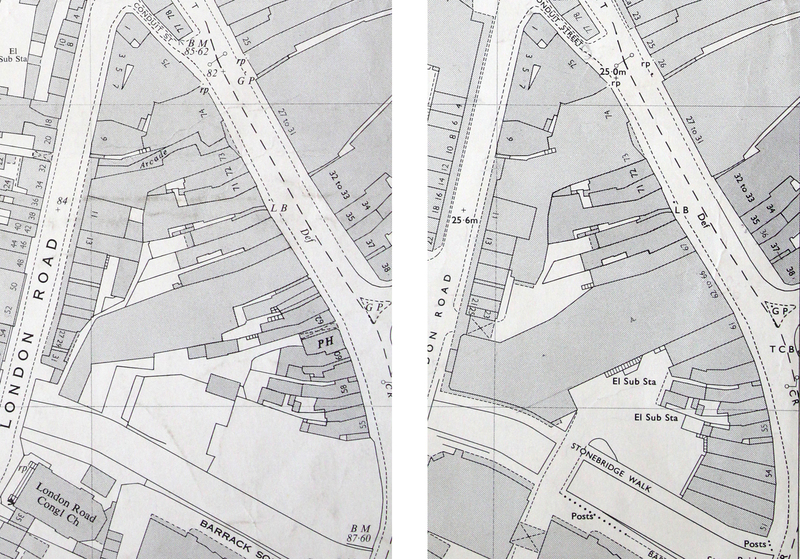 For a more direct comparison, we took photographs of the OS maps from 1963 and 1974 and uploaded them into Photoshop. Extract from the OS Maps of 1963 and 1974 showing the sites of 61-66 High Street. The 1963 extract has been highlighted in red, while the 1974 extract has been highlighted in blue. From there we layered the maps, drawing around the border of each property using different colours to make it easy to differentiate between them. Areas where the borders had shifted were then clearly visible, indicating where and when development had occurred. Extract from the 1963 map highlighted in red, layered with the extract from the 1974 map highlighted in blue. At first glance, the OS map of 1963 appears remarkably similar to the OS map of 1876. There are still plenty of small properties, packed closely together. The Queen’s Head is still present, identifiable by the ‘PH’ for public house. The property retains its distinctive shape and the narrow passageway, sandwiched between 61 and 62, is still visible. The biggest and most obvious changes have occurred by the OS map of 1974. The 1974 map presents a significantly changed section of the high street. The former Queen’s Head building has been demolished, and in its place a uniform, rectangular building has been erected. The narrow passageway has been built over and now features as part of the sites of 61 and 62. The sites of 62-66 now form one large property, occupied by Marks and Spencer’s. Photograph of the west side of the high street including the Queen’s Head in the centre and several properties to the right that would eventually form part of the Marks and Spencer’s site. Photo by Fred Spalding. A current image of the west side of the high street. This map comparison perfectly illustrates how the town was transforming in the 20th century to accommodate modern development. In many cases the new buildings replaced small, dated properties which were considered no longer fit for purpose. The imperfect, quirky buildings visible in the Spalding photograph above were replaced by larger modern buildings built over several of the historic plots. Whether these new, spacious retail establishments improved the overall appearance of the high street is open to debate. If you would like to use historic maps for a project of your own, do come and visit our Searchroom where staff will be happy to help you get started. And that’s all from the Chelmsford Then and Now project! We will shortly be publishing the results of a similar project undertaken in Colchester so if you like old maps and historic photos there are more treasures to come. This vivid description of Leigh-on-Sea comes from William Camden’s Britannia, a survey of Great Britain and Ireland published in 1586. We are diving in to Leigh’s history at the moment ahead of Leigh-on-Sea on the Map on Saturday 18 February 2017, when we will be displaying a selection of our historical maps and images of Leigh at The Forum in Southend, showing its transformation as development spread ever further out from the small old town area that hugs the Thames shoreline. Here we share some sneak peaks at some of the maps and postcards we will be bringing with us to display. The centrepiece of our display will be Leigh’s tithe map, which dates from 1847. The map shows Leigh just before the coming of the railway, when it was still a small fishing town or village. Tithe maps are brilliant sources for researchers interested in the history of their family or a particular property or place, as each plot on the map is numbered. This is because the maps are accompanied by a list of who owned and occupied each property, as they were used to work out how much tax people should pay based on the value of their property. The system of taxing people according to the value of their property replaced a much more cumbersome medieval system of people rendering a tenth of their agricultural produce to the church. 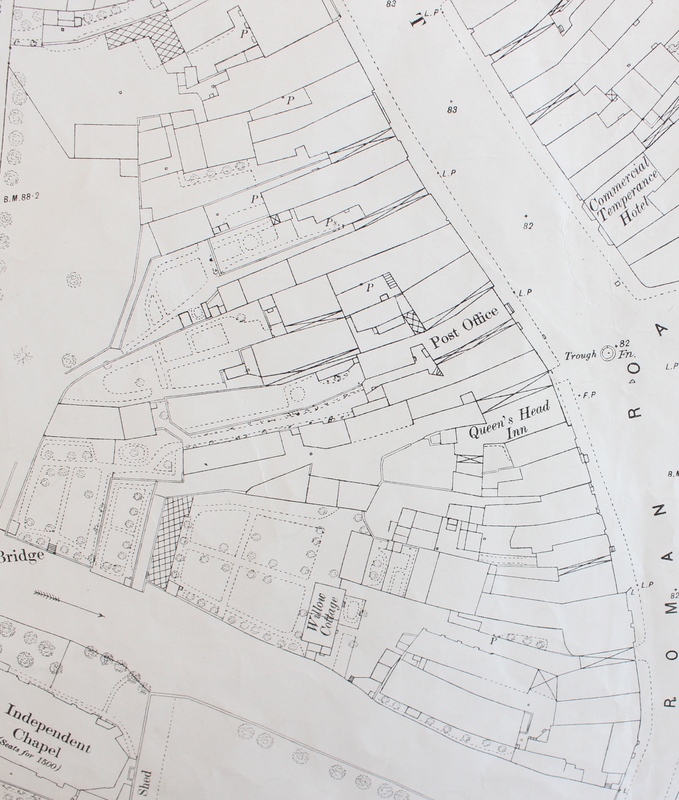 Soon after the tithe map was prepared in 1847, another map of Leigh was produced which shows us the dramatic transformation the old town was about to undergo. This map was prepared in connection with the building of the London, Tilbury and Southend Railway, and shows the somewhat brutal course the track was to take through the town. Although each building is numbered and presumably linked to a schedule giving names of owners of the properties through which the railway would pass, the whereabouts of the schedule is unknown. The map shows all the familiar Leigh landmarks, including the Bell and Ship inns, the Billet and Smack public houses, the Coast Guard House, the Custom House and individual wharfs and quays. The building of the railway sliced the old town in two, marooning the High Street on a thin strip of land along the edge of the Thames. Victorian progress was rarely halted by the presence of old buildings that today we would consider precious, and in Leigh the presence of steep cliffs meant there was no alternative but to drive the railway through the town. The best maps which show the development of Leigh from 1890 to 1939 are the large scale ordnance survey maps of the “County Series”. These were made in three waves – the first edition, made in the 1870s, the second edition, from the 1890s, and the New Series, made between the 1920s and 1940s. The county was entirely mapped in two different scales, 6” to the mile and the fabulously detailed 25” to the mile. Unfortunately we do not have an original 25” to the mile first edition OS map showing Leigh, but we will be bringing a well-known copy of it that was made later. The original map dated from 1873, and we can see that by this time Leigh remained a fairly small place, although now with a railway running through its centre. We can see that adjustments had been made to existing buildings to accommodate the railway, and that a ‘New Road’ had been built alongside it. Amongst the new buildings shown are the Smack pub in a new building across the street from its original site (which by this time was underneath the railway line) and, on the hill below the church, a new National School which was built in 1852. Leigh was resurveyed in 1897 for the second edition of the County Series. By this time, much of the open land around the old town had been divided up to be sold as plots, and new streets had been planned out, with pockets of building underway. This sort of development is seen frequently in our maps of Victorian Essex. Plots were either bought by individuals who then built their own houses, or purchased by developers who built who rows or streets of houses. Some plots were reserved for shops or hotels. 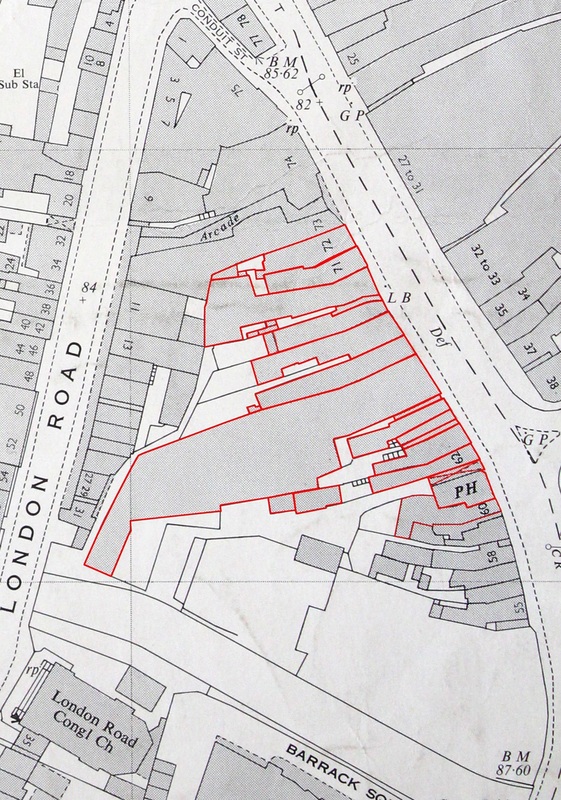 The next major survey of Leigh took place in 1922, and the map which resulted shows a fairly spectacular explosion of new housing that had been built since the 1890s. The town we see in this map resembles much more closely the town we can see today. Beside the railway, a tramline had been built running along The Broadway from St Clement’s church, past the Grand Hotel, and then along Leigh Road into Southend. The most recent map which will be on display was made soon after the end of the Second World War, and shows where bombs and other missiles were dropped on Southend, including Leigh, during air raids. If you live in Leigh, was your house near one of these bomb sites? For more historic maps and images of Leigh, join us at Leigh-on-Sea on the Map on Saturday 18 February 2017, 10.00am-3.00pm, at The Forum, Elmer Square, Southend-on-Sea, SS1 1NE. Entry is free, but if you could make a donation to support our work we would really appreciate it. Today we are used to being able to carry a map of the world on a smartphone in our pocket, being able to search for anywhere that takes our fancy, to zoom in on it and see not only maps but aerial photographs and streetviews. This is all very easy to take for granted today, but for our ancestors making a map was an expensive and specialist process. Yet human beings have a long history of making maps to visualise and understand the world around them, and we are lucky to have maps of Essex dating back to the sixteenth century. A new book, Printed Maps of Essex from 1576, by map expert Peter Walker, brings together all the printed county maps in our collection for the first time. Packed with full-colour illustrations it will be a wonderful companion for any historian of our county. The book is being officially launched at a special event in Saffron Walden on Saturday 21 May 2016; see our events page for details. Since we like maps so much, we thought we would share a few of our more unusual county maps with you here in the run-up to the book launch, starting with the oldest map of Essex. This map was made by Christopher Saxton (c.1540-c.1610) in 1576. It would have been printed on a printing press using an engraved copper plate, and then hand-coloured afterwards. Saxton was the first person to produce an atlas of British counties, in 1579, based on his 7 year survey of the 52 counties of England and Wales. Some counties are combined on sheets, but Essex has its own page. The map was commissioned when fears of a Spanish invasion of England were rife. This may be why the map concentrates on river access to the county, and no roads are shown. The map shows all the towns and villages and a few of the larger mansions with their names; only a small number of parks and bridges are named. Certain estates, such as Hatfield Forest, are shown as enclosed, or impaled, telling us that it was private land, belonging to somebody of significant wealth. Few other topographical details are marked except rivers, woodland and Shell Haven, the blockhouse on Mersea Island, and the miniature but unnamed drawing of Stanway beacon. The title is on an elaborate cartouche surmounted by the Royal Arms of Queen Elizabeth I, and below are the quartered arms of Thomas Seckford, Master of the Requests to the Queen, Saxton’s patron. Saxton’s map will be on display in the Searchroom throughout spring 2016, and for more maps come along to the launch of Printed Maps of Essex from 1576 on Saturday 21 May. For the past six months, the You Are Hear project team at the Essex Sound and Video Archive has been asking you what Essex sounds like. Whether stopping innocent passers-by in shopping centres, appealing to the public through newspapers, or calling for suggestions through e-bulletins, we have been asking you what noises you hear in your daily routine, what noises you associate with the county, what sounds represent your community. 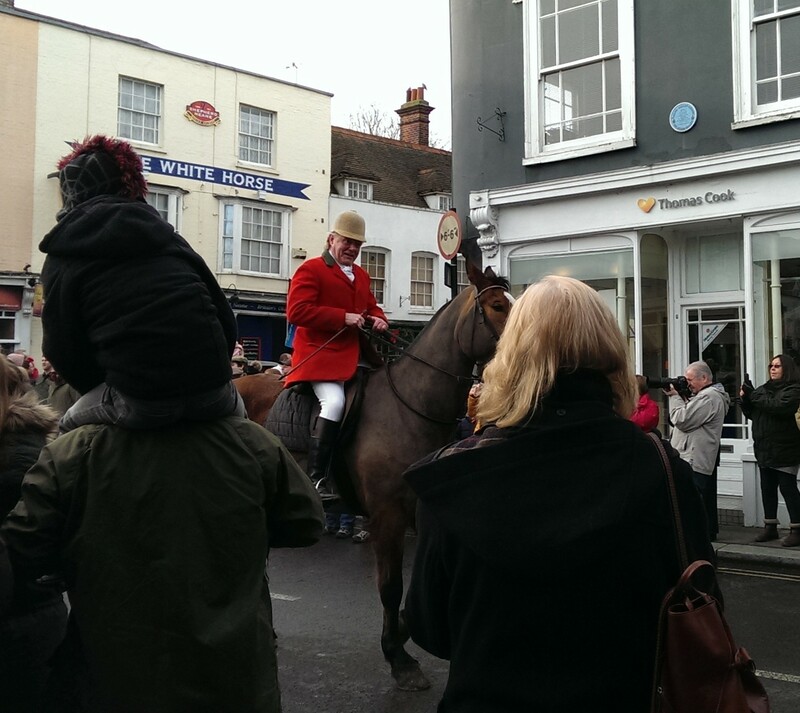 The hunt parade through Maldon, 1 January 2016. Image courtesy of Stuart Bowditch. From church bells to firework displays; the annual New Year’s hunt parade through Maldon to the sounding of ship’s horns at Tilbury to bring in the New Year (yes, he managed to capture both, and more besides that day! ): see if your suggestion of an Essex sound has been recorded. Peaceful Dedham Vale in north Essex. Image courtesy of Visit Essex. You can then compare it with a recording made on that site in 2015, capturing the busy atmosphere of High Chelmer on a Saturday. Try it out here. If your sound suggestion has not yet been added, do not fear: our site is still a work in progress. Stuart will continue to record Essex sounds over the next few months, gradually uploading them to the audio map. 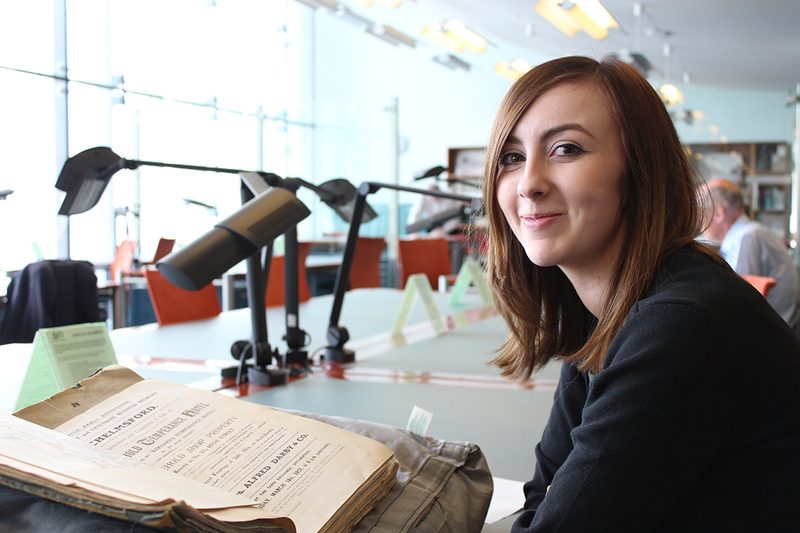 We will also keep adding historic recordings as they are digitised, as part of this Heritage Lottery Funded project. We are also happy to continue to receive suggestions of places and events to record, though we will not be able to include everything within the scope of the project. We would love to hear any feedback you have, so that we can continue to improve the site and pass on your comments to our website developers, Community Sites. Please be gentle with us, though: we are still in the development phase! We would also be grateful for any volunteers to test the map more extensively, particularly if you are using accessibility software. Please get in touch to find out more. For more information about the You Are Hear project, you can visit the project site. We are in the midst of preparing for our next ‘on the map’ outreach event, which will take place in the village of Messing near Tiptree on Saturday 19 March 2016. We have done a few of these events in different locations around the county, taking a timeline of maps from our collection out for a special pop-up display. One of the maps we will be taking with us on this occasion is this 1650 map showing the lands of Messing Hall (D/DH P1). Messing Hall itself is shown to the east of the village centre as a very grand moated building, with a farm to the north. The map is part of a collection of papers relating to the Luckyn family of Messing. Sir Capel Luckyn acquired the estate of Messing Hall in 1650, so presumably he commissioned the map as he took possession of his grand new property. The map makes an immediate visual impact, but on closer inspection bears only a passing resemblance to the actual layout of Messing – cue ERO staff members scratching their heads and poring over maps, aerial photos and any histories of Messing we could get our hands on, trying to work out what the 1650 map actually showed us. To begin with it all seemed a confusing mess. While the 1650 map shows the grand Messing Hall on a road heading east out of the village, the Ordnance Survey map of 1874 shows that there is no such road, leaving us with a mystery to solve – where was Messing Hall? The representation of it on the map no doubt blows the size of the house out of all proportion, but clearly an important property existed and we could find no obvious sign of it on any later maps. There were two main candidates for the site – Harborough Hall, to the south of the village, and Messing Lodge, to the north. Our sights first landed on Harborough Hall – it was the closest substantial property to the village, and sits on a bend in the road, as does the property on the 1650 map. We read that the manors of Messing and Harboroughs merged in the 1400s, so perhaps the names had been used interchangeably. Messing Lodge, meanwhile, just seemed too far from the village and too far north. Could the 1650 map really be that inaccurate? We hunted for anything that would help us tie up the things represented on the 1650 map with more accurate later maps. Our first breakthrough came from matching up Oynes Brook, shown on the 1650 map, with Domsey Brook shown on later maps. Once we had found the brook, we were able to match up the forked road shown in the 1650 map to the north of Messing Hall with the fork shown in later maps above Messing Lodge. Although not quite the same shape, on both maps one fork crosses the brook (and stops short just after it), and the other fork becomes ‘Easthop way’ or ‘Easthorpe Road’. There are also water features on the 1897 map which could relate to the moat shown in 1650. This was pleasing evidence, and was further supported by some of the field names surrounding the property. The 1650 map shows ‘Great Charcums’, ‘Charcum meadow’ and ‘Charcums spring’ to on the opposite side of the road to Messing Hall. On the tithe map of 1839, fields near to Messing Lodge are known as ‘Little Chalkhams’ and ‘Great Chalkhams’. With the evidence of the brook, the fork in the road, the road to Easthorpe and the Charcum/Chalkhams field names, we think we have a satisfactory answer to our mystery, and we can put Messing Hall back on the map. One of the joys of research is problem solving, and the excitement when things finally fall into place, especially when you can share that joy with fellow researchers. Fortunately for the 1650 map, what lacks in accuracy it makes up for in exuberance. Come along to see it for yourself at Messing about with Maps on Saturday 19 March at Messing Village Hall. 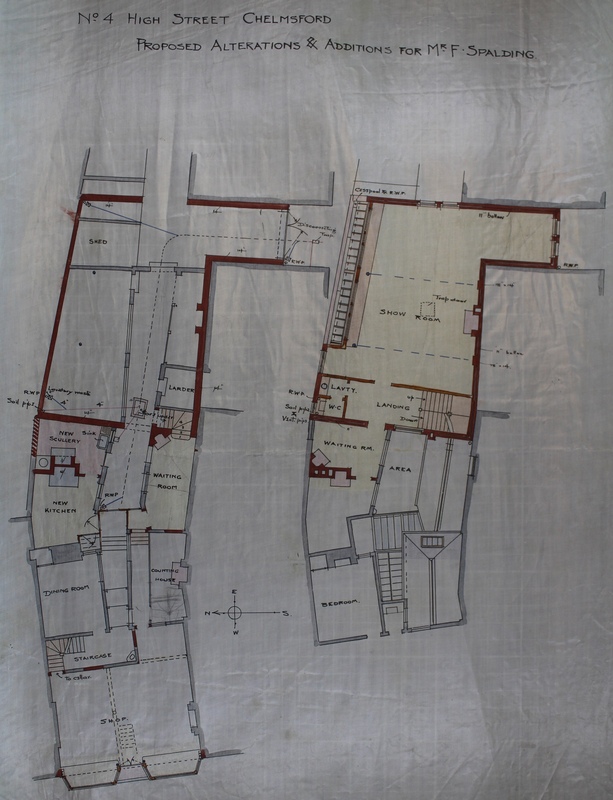 A chance to see historic maps of Messing kept at the Essex Record Office in Chelmsford, including a hand-drawn map from 1650 and the Messing tithe map of 1839. In this third post in our series looking at the history of Chelmsford High Street, Ashleigh Hudson looks at nos. 4-5 High Street through the centuries. Find out more about the project here. 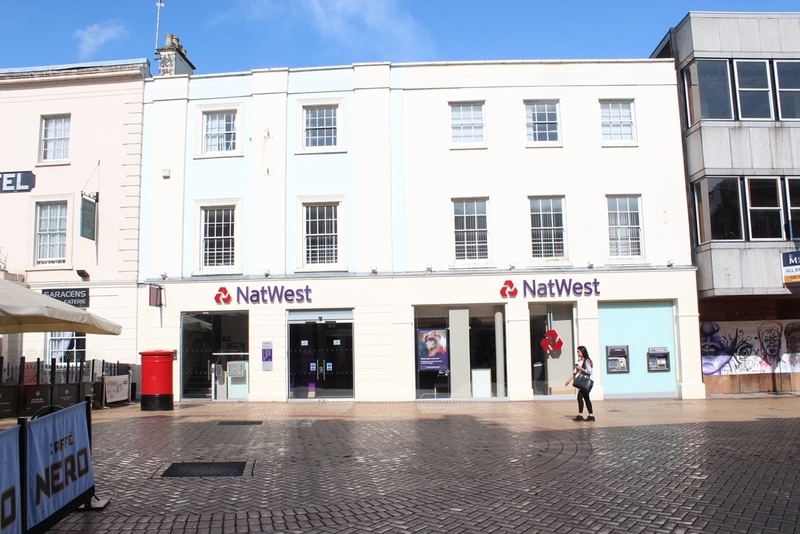 The current site of NatWest Bank at the north end of Chelmsford High Street is most commonly associated with the Spalding family who occupied the property from 1892. 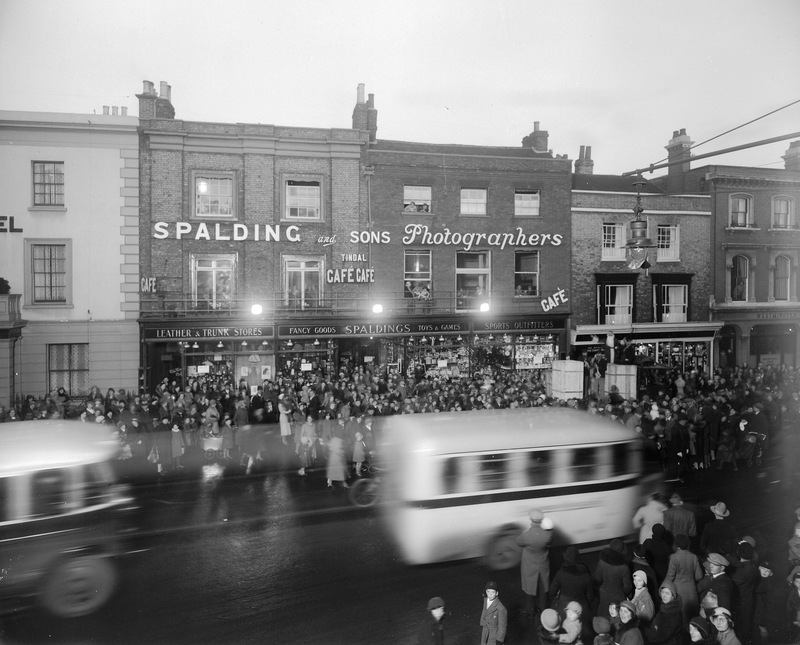 Fred Spalding junior ran a successful photography and fancy goods business which remained on the site until the mid-20th century. The property was built in the 18th century on the former site of the Crane Inn and was mostly used as a private residence until the arrival of the Spalding family. During the 16th century the Crane Inn, which was owned by Sir Thomas Mildmay, occupied the sites of 4-6 high street. The Crane Inn and yard, which is visible on the Walker Map, comprised numerous buildings which were progressively divided into smaller, individual properties during the 18th century. Number four was purchased by Thomas Old, a wine and brandy merchant, who rebuilt the property in 1784. The owner of number 5, Robert Tweed, perhaps inspired by his neighbour, rebuilt his own property the following year. The properties continued to function as private residences through to the 19th century. From 1871 number 4 was owned and occupied by wine merchant John Champ. The Champ residence was an attractive three-storey brick property. Early photo of the High Street taken from the Shire Hall. The Champ residence can be seen on the right of the Saracen’s Head Hotel. The property obviously made an impression on the young Fred Spalding who purchased it shortly after John Champ’s demise in 1892. Fred Spalding’s father, also called Fred, was a self-taught photographer who got into the business really as the art itself was taking off. Fred senior moved to Chelmsford around the same time, where he set up business on Tindal Street. The Tindal Street store proved prosperous and this was where the young Fred Spalding learnt the family trade. 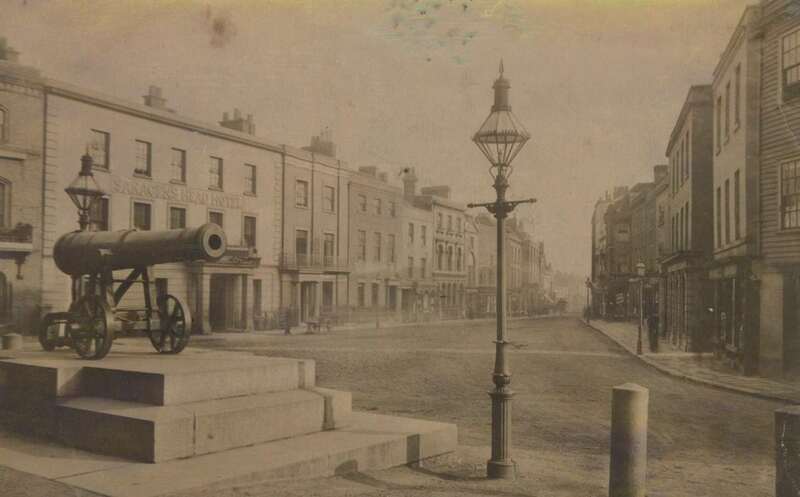 Photograph of Tindal Square in the late 1860s. In the centre of the image is the original Spalding shop. The premises is fairly small and quite understated in comparison to the later shop situated on 4-5 5 High Street. A glass studio, necessary for photographers prior to the introduction of artificial lighting, is visible on the roof of the property. 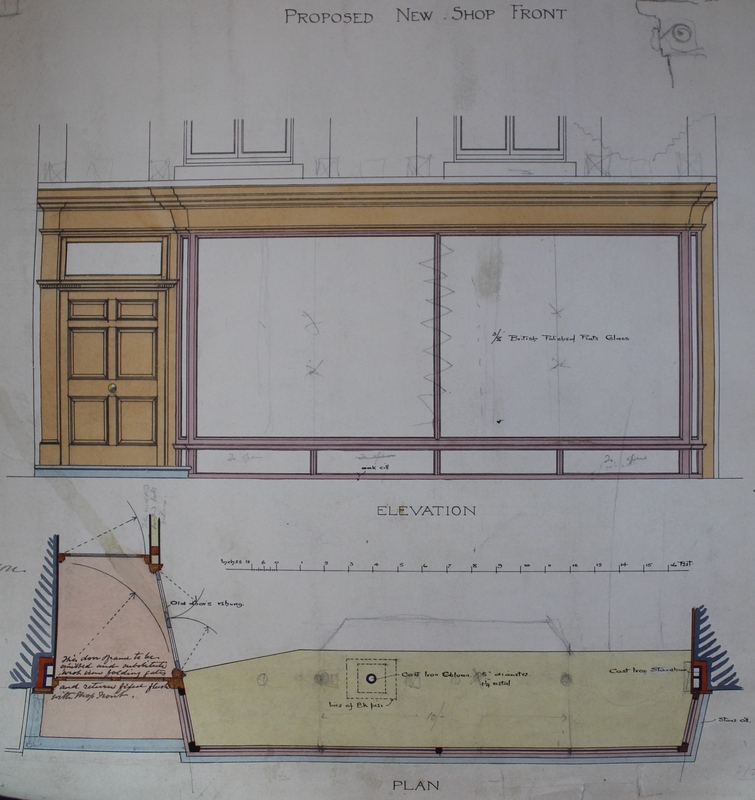 By 1892, Fred Spalding junior was on the hunt for new premises to accommodate his expanding business. John Champ’s residence, described by a sale advertisement as occupying the most ‘commanding and desirable’ location in town, came up for sale in October of that year. Spalding surely agreed with the advertisement having purchased the property shortly after. He promptly commissioned the noted local architect Frederic Chancellor to redevelop the existing buildings to enable to smooth transition from ‘house’ to ‘shop’. Chancellor’s plans for the changes have survived and are deposited among his practice’s papers at ERO. 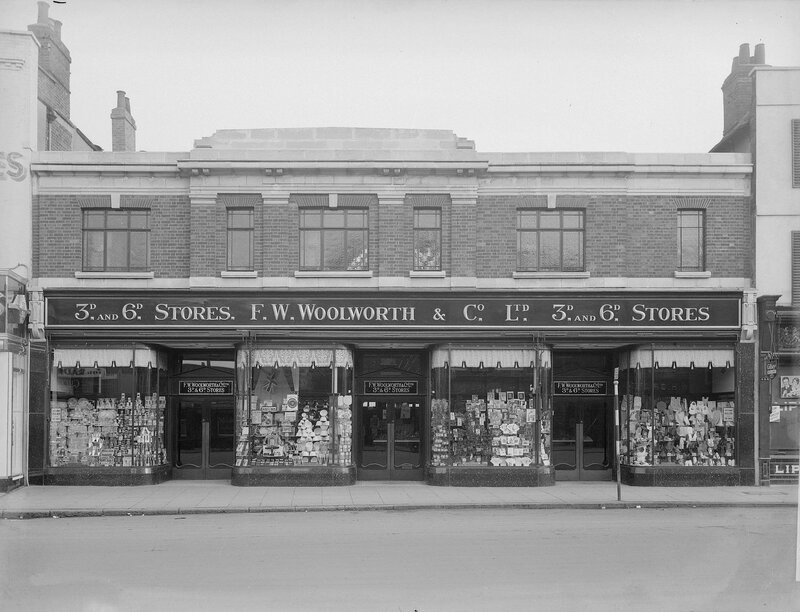 The most noticeable change was the addition of large, glass display windows at street level which were used to display photographs and goods for sale. The shop continued to thrive throughout the first half of the twentieth century. 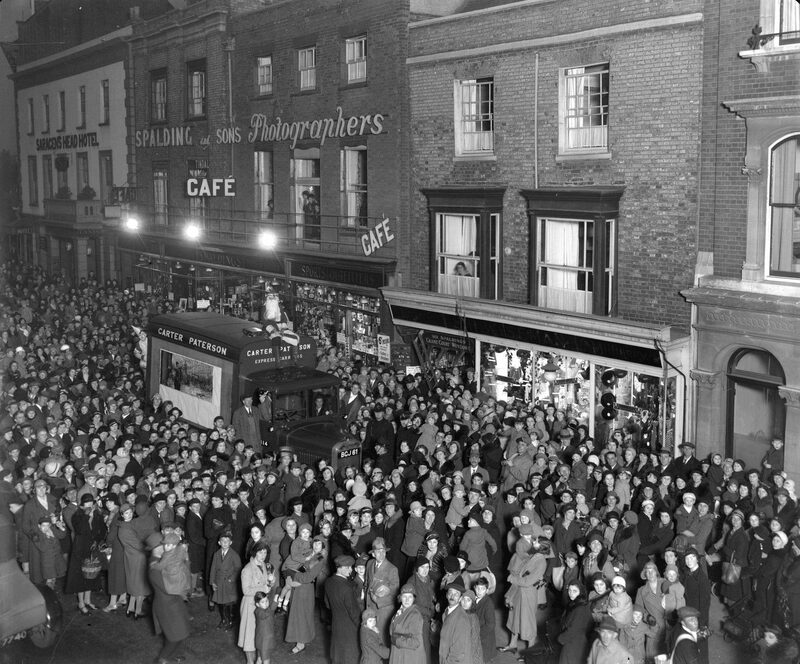 The large crowd, depicted in the photograph below, have gathered outside the Spalding shop to await the arrival of Father Christmas, who made an annual detour to visit a grotto located inside the premises. This tradition was a popular and very well attended event. The shop continued to operate during the war years, providing emergency shelter for up to 150 people. Shoppers caught on the high street during an air raid could find safety in the extensive basement below the Spalding shop. Frederick Spalding survived the war but died shortly after. He was a much revered member of the town, having served for over 50 years on the Town Council as well as three consecutive terms as Mayor. The closure of the shop swiftly followed, marking the end of an era for Chelmsford photography. For the best part of a century, the Spalding family captured both the history and character of the town. The legacy of this endeavour can be found in the vast collection of photographs which are housed in the Essex Record Office. The Spalding image collection, which number in excess of 7000, is available for viewing from the Essex Record Office Searchroom. At first glance the current NatWest building appears radically different but in reality, the original features of the 18th century building still remain and are visible beneath the layers of pale blue and cream paint. 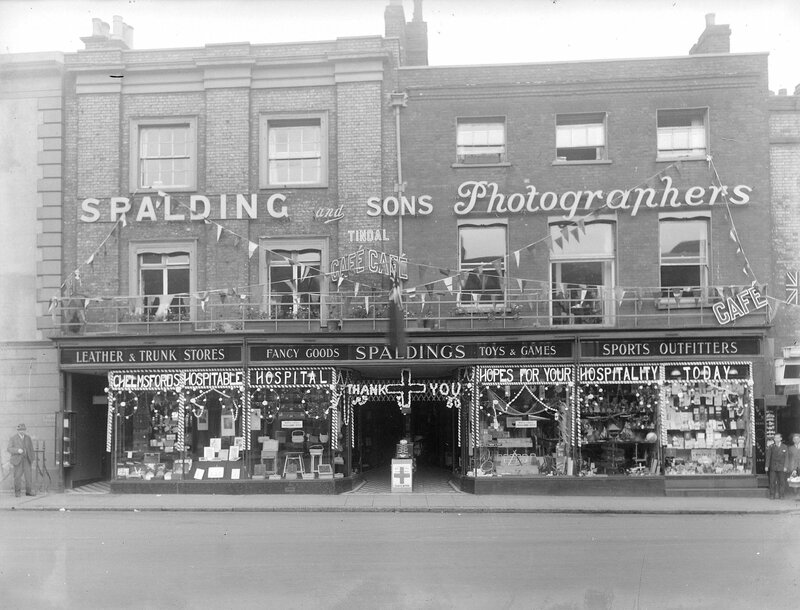 If you would like to find out more about Fred Spalding and his photography shop see The World of Fred Spalding by Stan Jarvis available in the ERO Searchroom. Alternatively pop into the ERO and browse the fantastic collection of Spalding images located in the Searchroom. A Royal Charter, granted in 1199 by King John, authorised a weekly market to be held within Chelmsford. A town grew around the market and by the 16th century, the basic shape of the high street had been firmly established. In fact the essential pattern of the High Street has not changed a great deal since the 16th century. A quick comparison of John Walker’s 1591 map of Chelmsford and a map of the high street today reveals that the fundamental shape of the town is very much the same. Internally, the High Street is quite different, with all of the timber buildings featured on the Walker Map long replaced by brick buildings of modern design. Economic factors, social mobility and technological advancements have all impacted on the structural development of the High Street. Development has occurred sporadically, and according to the whims of a particular owner at a given time. By the latter half of the 20th century, the demand for retail and a growing population seemingly justified the demolition of vast portions of the town, which were deemed no longer fit for purpose. To many long-term residents of Chelmsford, modern development has completely obscured the town they knew and loved. Extract from the OS Map of 1963 (left) and 1974 (right). 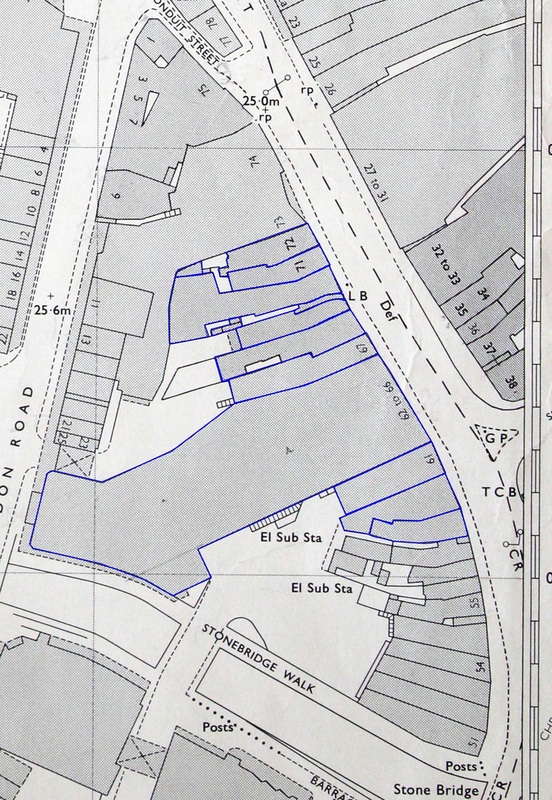 A comparison of the two maps reveals that by 1974 many of the individual properties situated on the west side of the high street have been demolished or consolidated to make way one large store, Marks and Spencer’s. Marks and Spencer’s currently occupies the former sites stretching from 62-66. 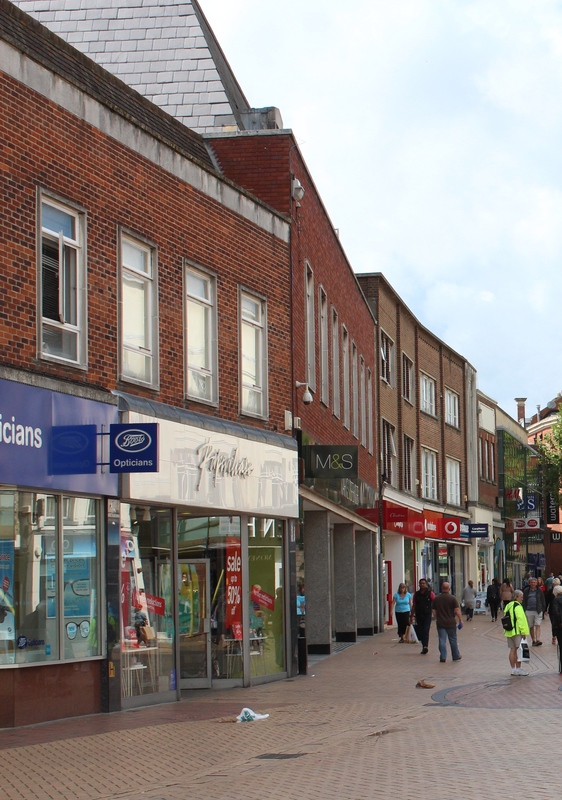 One of the biggest challenges facing Chelmsford High Street is a perceived lack of history; the belief that 20th century development has stripped away the heritage and integrity of the town. In actuality there is still a great deal of history hidden, often just above street level. Even where the ancient building has been demolished, the plots themselves have a story to tell. It is entirely possible for modern development to occur and coexist with areas of historic value; the challenge is building awareness and a sense of appreciation for the history behind the High Street. 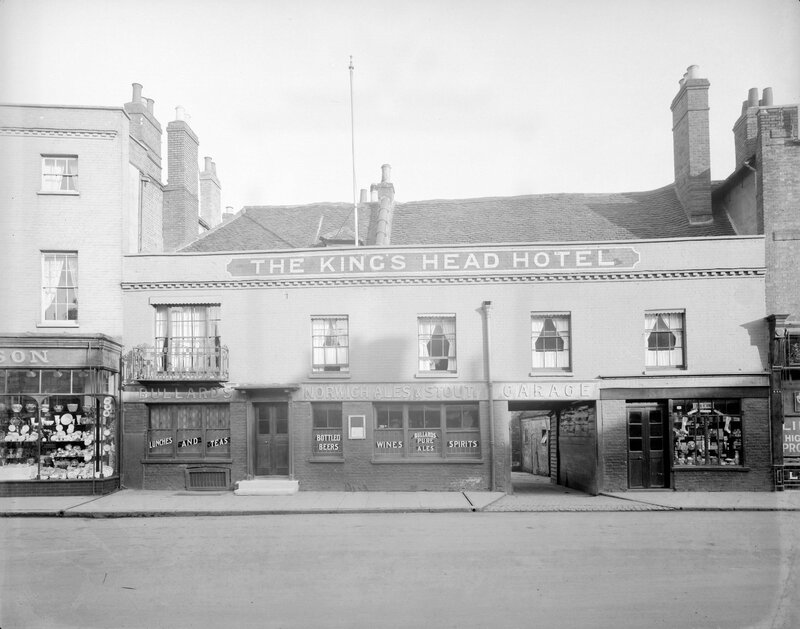 Photograph of the King’s Head shortly before it was demolished to make way for a branch of F.W Woolworth. The King’s Head had occupied the site since the 17th century and was a central part of town life throughout that period. 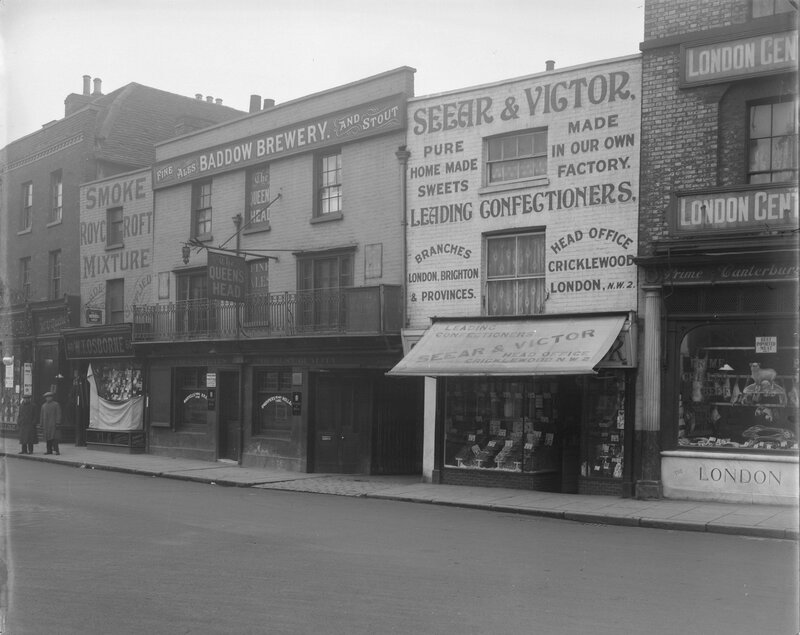 Though the physical building has gone, the King’s Head is a large part of the history of 40-41 High Street, so much so that the carpark to the rear of the property was named in its honour. Photograph of F.W Woolworth in the 1930s. The photograph reveals an entirely new building sitting on the former site of the King’s Head. 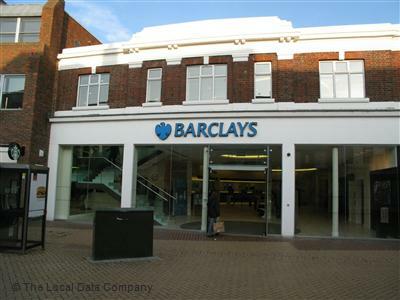 The former Woolworth’s building is currently occupied by Barclays Bank. A quick comparison of this photograph and the one above reveals a high level of continuity, just above street level. The aim of this project is to construct a historical profile of selected sites across the high street using a range of different sources. The research gathered will be presented in a variety of ways to highlight areas of continuity and change. It is hoped that this project will encourage a greater awareness of the historic development of Chelmsford High Street and a stronger appreciation for the town itself. The Essex Record Office has provided most of the primary material for this project. Supplementary material has been sourced from The Essex Newspaper Archive and Ancestry, both of which can be accessed in the ERO Searchroom. Hilda Grieve’s detailed history of Chelmsford The Sleepers and The Shadows was a fantastic starting point for much of the research, and a constant source of reference throughout. Look out for the Chelmsford Then and Now series of blog posts to be posted on the ERO blog shortly. Alternatively, why not check out our new HistoryPin page which contains a range of photographs of Chelmsford High Street through time.